When you buy a product, would you want to know the exact date it was going to break and stop working? How about this, I'll give you a product for $50 cheaper and give you the exact date it will fail. Nothing to worry about at all. The device will work 100% for until the expiry date. You know when exactly to buy the replacement. If you are satisfied with my product, then I will give you another one with the same condition or probably better. Do you know of another product like this one? Where you know the exact date it will break or stop working? Well, it is kind of like a phone contract? You know it will stop working in exactly two years as per the contract. Ex: Buy a laptop. It could last one year or five years depending on use, care, and lucky quality of device. What if you can get a guarantee that it would work for two years exactly, but then you would have to replace it? This laptop could be cheaper because manufacturers know people will need to buy a new one, thus more revenue. And the specs will be better in the replacement too. Conclusion? This deal is good for people who have a hard time keeping care of their items. It is a worse deal for people who know how to maintain their products. People play drums on car steering wheels, so why not play the guitar and piano too? It could just be a slip-on cover. Or a clasp for it, around a part of the wheel. Is a car with smooth sides the most aerodynamic it could be? The following graph explains the three different types of goods and services very well. It helps in determining what type of pricing structure you should use when you sell something. In my realm, it is how to price a smartphone application. After the picture is my own take on the 3 categories. 1. Consumables, seasonal apps, fad/meme apps: These apps will be used only a few times at the most, then eventually probably uninstalled. Examples include apps that play off from something happening in the news, or an app for an Internet meme like that one dancing craze I forgot about already (Harlem shake). 2. News, reference sheets, utilities, tools: These apps will always be of use to the user, and functionality in them typically don't change drastically. Examples include flashlight apps, unit converters, information apps about a particular topic, and hourly/daily/weekly news feeds. 3. Productivity, social, leveling-up games: These apps get more useful the more you use them. Example: When you store more files in Dropbox, then the app becomes more useful to access, backup, and share files, thus you use it more. When using these apps, there is either a real or perceived difficulty in changing service providers. Users may worry about the future of these apps much more than the other two categories. In each of the app marketplaces, apps that fit the first category (with consumables) are the most prevalent. And, apps in the third category are the most scarce. And, or course, there are always exceptions in the examples I gave, I will not list them all here. Here's the pricing structure that should be used, in general, for each of these categories (if you want to make money from the app). An easy way to remember is: charge for the app when it is the most valuable to the user. 2. In order of preference: (1) Subscription model to keep all the information updated, or just to have access to the data/information. (2) Charge once, early. Then have additional (major) updates cost extra. (3) Ads. 3. Freemium: App should start off free and have enough basic features in order for most users to be satisfied with that. 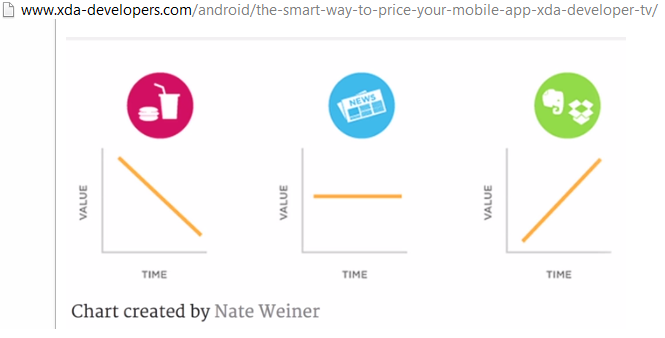 Then you should charge for more features only to users that get the most value out of your product. If you never have to update the app again, then a one-time fee is okay. But, if you are going to be providing updates to the app, then don't work for free! A subscription model or in-app purchases will allow you to stay in the business of creating more great apps and keeping that one updated and fresh. You don't have all the information yet required for building a proper business model. In addition to those 3 categories above, your app can be further classified into one of the following 4 categories. The biggest take-away from this graph is that most apps in the market are in quadrant 3 (least profitable), and it is very rare to have an app in quadrant 1, the most profitable quadrant. Wide appeal apps have the luxury of choosing to only charge once and still be in a profitable business because many new smartphone users will always need/want these apps. Thus, a "never ending" source of income. Narrow appeal (niche) apps will not be able to draw as many downloads. So, a charge once business model is not sustainable in the long run. Though, many developers of quadrant 3 choose to create a framework and keep switching out the data to create new apps very quickly and easily. Example: A Chuck Norris joke app and Shakespeare Insult app could share 95+% of the code by just changing the database where the information is pulled. 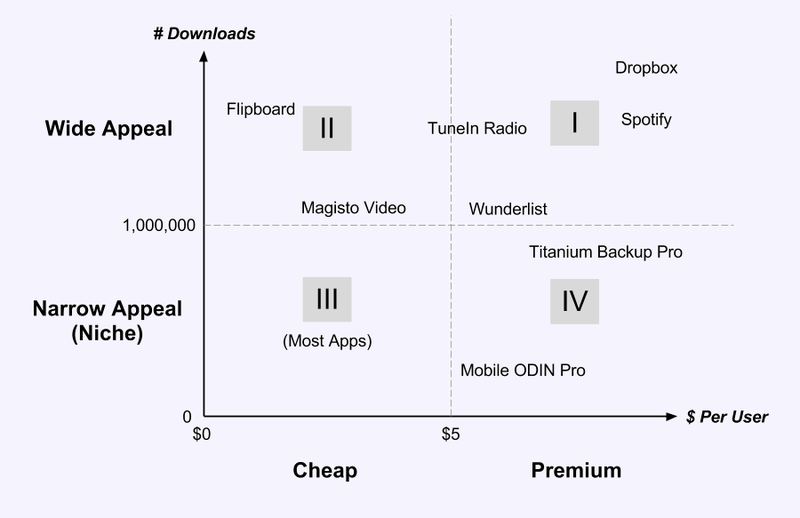 So, by creating many cheap niche apps, these developers are effectively reaching quadrant 2. In order to effectively/successfully create a profitable premium app, users must "need" the app. There is also probably little to no [close] competition. Your app has to truly shine. These apps correspond to the category 3 (freemium) apps of the first graph. Category 2 apps from the first graph are most likely to be classified in quadrant 2 or 4. And just about all Category 1 apps from the first graph are located in the third quadrant, but not apps in the third quadrant are category 1. If you have any further thoughts to share, then I'm all ears. Locks with timers for doors. They can only stay open for a car for a certain amount of time. Maybe have a permanent mode also.